It was Phil Kearns, of all people, who made the most pertinent observation about the lack of rugby nous in the Wallabies’ ranks as the dominant All Blacks unleashed attack after attack towards the end of their 38-13 victory in the first Bledisloe Cup Test. Spot on. And as it happened, the Wallabies mucked up that kick-off and turned the ball over for the All Blacks to launch another surging black-wave attack. Let us be honest here. Israel Folau has two great strengths to his game. He is a powerful runner with the ball when he bursts on to a pass. And he has a prodigious leap and an uncanny ability to get into to full stride as soon as he lands on the ground. It made sense for the first kick-off for the Wallabies for it to be long, leading to a tackle made deep inside the All Blacks 22 by Marika Koroibete. New Zealand had to scramble for several plays to retrieve the situation. Their opening minutes of play, during which they made a number of handling errors, reflected the pressure the Wallabies were able to put on them from the Koroibete chase. But the Wallabies continued this Plan A to use the long kick-off ploy after the All Blacks had sorted things out and were able to launch stinging attacks after the catch was made. Why did they continue to use what should have been a one-off ploy as their standard kick-off? Why didn’t they immediately revert in the following kick-offs to the short kick for Folau, the aerial master, to snaffle? The only answer I can give to these questions is that a game plan, Plan A, had been devised and the Wallabies’ leaders on the field were not sharp or masterful enough to challenge the details of this plan, even though it was not working. Other parts of Plan A, the pressure on the All Blacks first line runners and the tough charges up the middle by Lukhan Tui, and even David Pocock, worked splendidly – in the first half. It is not often the Wallabies go into half-time against the All Blacks in the lead, after all. But the restriction on the high ball tactics while Folau was on the field was one part of Plan A that never worked, because it was never really tried. Ironically, Folau muffed up his catch of the only high ball launched, well into in the second half, and landed awkwardly on his ankle creating an injury that forced him from the field. 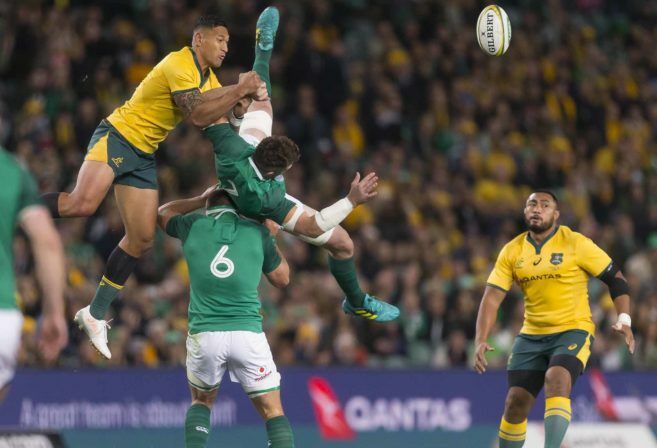 Before the Test, Folau was quoted as saying that he did not intend to change his jumping style, even though this had got him into penalty trouble against Ireland. Before the Test, as well, Bernard Foley was quoted as saying that he intended to take the attack to the All Blacks defensive line. However, in the heat of battle, against an All Blacks defensive system that went in low and fast for the tackle, Foley quickly began to sink so far back from the advantage line that if he had been in a pool he’d have been under water. It was noticeable during the first torrid half, when the Wallabies ran hard at the All Blacks, that the attacks were starting from a too-deep position. Why wasn’t this noticeable to Foley? Or the coaching staff emoting in their box? The All Blacks contained the early attacks, while conceded a couple of kickable penalties, and slowly pushed the attacking line back until the Wallabies made a passing or handling error. The point about all of this is that it is difficult to get through a modern defensive line if that line is set too deep. At some stage in the evolution of the Wallabies going into the World Cup next year in Japan, if the team is to have any hope of winning the Webb Ellis trophy, there has to be a radical change in the backline. The fact of the matter is that there is little threat there, in terms of flat-out pace, organisation or great skills. As Damian McKenzie and Beauden Barrett demonstrated once again, pace is the killer of any defensive organisation over the entire 80 minutes of a game, no matter how well organised it is, as the Wallabies were in the first half. That first half revealed a committed, hard-shouldered Wallabies side taking their defensive systems to the All Blacks. On numerous occasions, New Zealand were rattled and had to scramble out of trouble or defend resolutely to prevent try-scoring break-outs from the Wallabies. The injury to Israel Folau should allow Michael Cheika to experiment by playing both Tom Banks at fullback and Jack Maddocks on the wing in the place of Dane Haylett-Petty, who had a very average game for the Wallabies. Unfortunately, it seems Cheika has already decided that only one of Banks and Maddocks is going to start in Auckland. At some stage in the Rugby Championship, therefore, I would like to see a Wallabies backline with Kurtley Beale and Matt Toomua interchanging between at number 10 and inside centre, Israel Folau and Koroibete on the wings, Jack Maddocks playing at outside centre and Tom Banks at fullback. This would be a backline that at least challenged a defensive line with speed and, in the case of Folau, power. As for the pack, going forward, there has to be a long hard look at the Michael Hooper/David Pocock combination. Once the All Blacks worked out the Wallabies lineout patterns, they unpicked the code as expertly as bank robbers. This unpicking effort was made easier by the fact that the Wallabies had only three potential jumpers, rather than the four presented by the All Blacks. Any team can lose a couple of lineouts, as the All Blacks did, but to lose seven is unacceptable. There is one other complaint I’d raise, too. That is the seeming inability of the Wallabies leadership, on and off the field, to adjust their Plan A to what happened to it and to what the All Blacks were throwing at them, too. It was noticeable, for instance, that the All Blacks made several significant changes to their Plan A, which was not really working for them in the first 40 minutes, in the second half. In Plan B they used Waisake Naholo more to take the ball up in the middle of the field where he was too quick for the forwards marking up there. 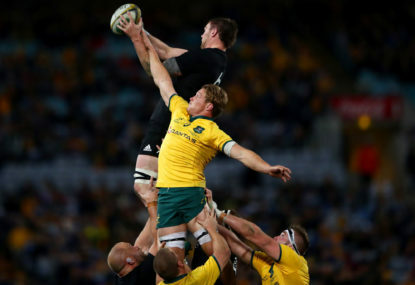 They shifted Brodie Retallick much wider where he monstered the outside Wallabies backs who were too small to survive the collisions he inflicted on them. Good coaches all understand that game plans, like battle plans in warfare, rarely survive the early collisions. This sort of understanding seems to be beyond the current Wallabies coaching staff and the leadership group on the field. It is tiresome to have to point this out time after time. But it has to be done. Sooner or later, hopefully, the message will sink in and the Wallabies will go out into a Test with the preparation to be able to play several different ways depending on what the opposition is doing and how it is responding to the Wallabies’ original game plan. The problem is accentuated for Michael Cheika and his players, admittedly, by the high quality of the All Blacks coaching staff in planning and selecting, and the mature and often brilliant play of the team and its leading players. Graham Henry declared before the Test that this All Blacks side may be the greatest of all the ones New Zealand has sent out in Tests. There may be something in this. There is not a player in the team who would not challenge for a position in any line-up in the world. A number of the players are among the finest the All Blacks have fielded in their positions, like Ben and Aaron Smith, Rieko Ioane (although he had a mediocre Test before being injured), Beauden Barrett, Kieran Read, Brodie Retallick, Sam Whitelock, Owen Franks and Joe Moody. The case of Whitelock and Retallick is interesting because they came to greatness through two very different paths. 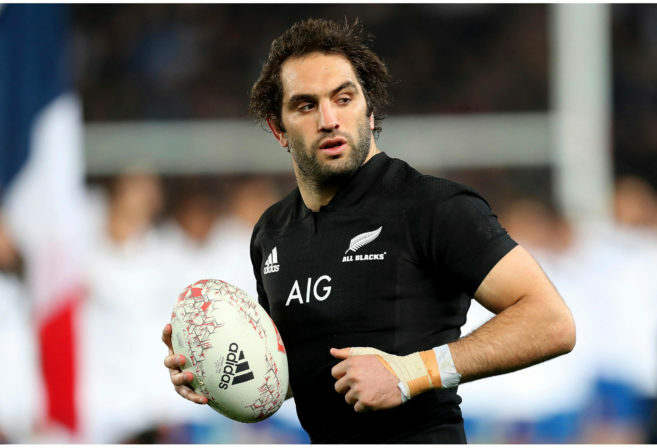 Whitelock, the first All Blacks lock in the team’s history to play 100 Tests, was a “hugely talented” basketball player as a teenager, according to the New Zealand Rugby media release, before he concentrated on rugby. His grandfather, Nelson Dalzell, was a tough lock and his great uncle was the hard-as-nails centre Allan Elsom. So there was hereditary and individual athletic talent in Whitelock’s background that explains his phenomenal lineout jumping, his strong carries and the innate intensity at which he plays. Brodie Retallick has a different story. He was rejected by the Crusaders franchise. 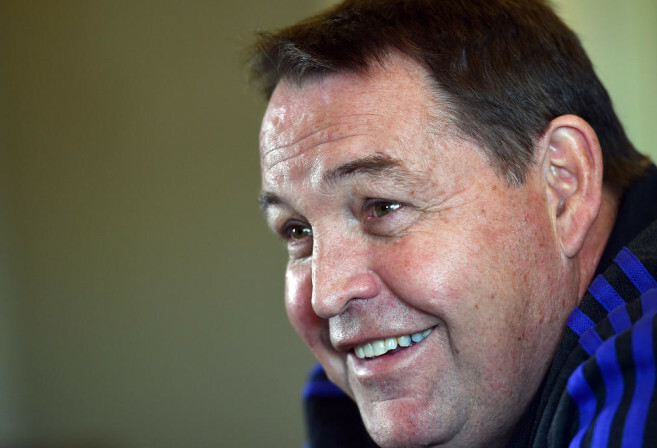 It was at the Chiefs that he developed the athleticism, rugby smarts (that dummy he sold to Foley was “like he was on commission,” the Sunday Telegraph noted), the turnover ability (he won a first crucial turnover early in the Test), his running and lineouts skills that make him, in my view, the equal as a lock of the great Colin Meads. With a rugby league culture dominating in Australia, compared with rugby, we can’t expect many or any Australian equivalents of Whitelock. But why can’t Australian rugby produce Retallicks, big players coached to high levels of skills in many facets of the game? It was done before with John Eales. But since Eales, there has been no one remotely up to his standard as a player. I will make a further point here. Eales was developed essentially in the amateur level when there was little money to be made in coaching. Now coaching is a big business. Whether this big business has produced better individual Wallabies or better Wallabies teams is problematic. Eales and Stephen Larkham, now rightly a member of World Rugby’s Hall of Fame, several other members of the great sides (Mark Ella, Nick Farr-Jones, David Campese, Matt Burke and so on), coached by Alan Jones, Bob Dwyer and Rod Macqueen, are and will be Hall of Fame members. But where are the potential World Rugby Hall of Fame members who have started as youngsters their careers from 1996 or later in Australia? I can’t see any of the current generation of players, for example, as obvious candidates ahead of so many, say, of their All Blacks counterparts. What is really galling about this is that the current leadership of Australian rugby, at the professional level, has virtually eliminated the influence and guidance of those coaches most responsible for the three great eras of Australian rugby.